Well, it’s been a while since my last update. I haven’t been traveling much, mostly hitting up local favorites like Worthy Burger. But some recent projects at work have caused me to spend a lot of time testing, and as a result, I’ve spent a rather large amount of time in Massachusetts at a subcontractor around Fort Devens and Boxborough. Like a lot of my work destinations, the area is pleasant enough, but it’s not an area with a lot of notable food options. Indeed, it takes a bit of research to find anything other than the restaurant associated with the hotel… if you know otherwise, please let me know! 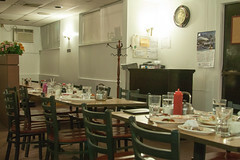 But when looking at various local reviews, there was one place nearby that did get consistently good reviews: Woo Jung. 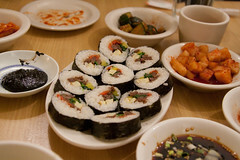 Located just outside of downtown Ayer, MA, Woo Jung is a cozy little Korean place. Located in a small, nondescript building just down from a strip mall, Woo Jung is one of those places that unless you were looking for it, it probably wouldn’t register on your radar. It’s a tiny place, with seating for maybe 25 customers fairly tightly packed into a small dining room, but it’s also a warm and inviting spot. Grateful that I had called ahead for reservations, my coworker and I were quickly greeted and seated. 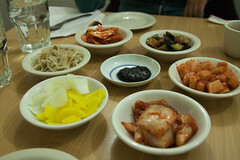 And quickly found ourselves with a nice table full of hot tea and banchan. Banchan are one of the things I like about Korean food: a nice, broad assortment of little side dishes, in this case some very flavorful kimchi, some similarly spiced bamboo shoot, and several pickled vegetables and sprouts. Woo Jung definitely has some of the more flavorful banchan I’ve had in recent history. We then placed our orders. We started with a side order of kimbap (a sushi-like Korean appetizer with rice and nori wrapped around marinated beef and veggies). Meanwhile, I opted for one of my favorites: jajangmyeon, which is basically a noodle dish served up with a black bean and pork sauce. My coworker opted for one of her favorites: kimchi chigae (kimchi soup). The kimbap was a great start to the meal, with a rather sizable plate of sliced kimbap arriving shortly after our order, with the center still a bit warm. Using a nice rice with a fairly strong sesame oil flavoring to it, this was a really good rice roll built around a core of really flavorful beef and pickled veggies. The result was a nice combination of the flavors I like most about Korean food: sesame oil, peppers, and marinated beef. My noodles were similarly good. 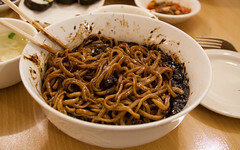 While jajangmyeon arrives as a not-terribly-photogenic dish, once the sauce is mixed into the noodles, the result is a very rich and plentiful bowl of tasty noodles covered with a rich, porky brown sauce that is usually very salty, but here at Woo Jung it was more savory and flavorful, with a nice rich profile of flavors. I ended up filling up only halfway through my bowl, leaving enough for a very good lunch at work the next day. Similarly, my coworker thoroughly enjoyed her kimchi chigae. The soup was fragrant, with plentiful amounts of seafood sitting in a rich and spicy kimchi broth. Served up with some rice, the resulting dish was also more than she could eat as well, so we both ended up with a good amount of leftovers for lunch. 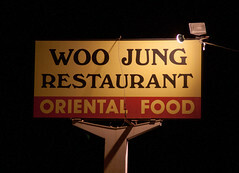 Overall, we both really enjoyed Woo Jung. It’s one of the best Korean restaurants I’ve been to, and takes very good care in preparing their dishes. The staff is friendly and efficient as well. Our only mistake? We didn’t realize that Woo Jung is BYOB, so next time we’ll bring some beer along as well. Back in August (while Carol and I were in Iceland), one of the greater Upper Valley area’s most anticipated restaurants, Worthy Burger, opened for business. The location itself has been the source of a bit of drama in recent years; originally it was supposed to be a bar run by Freighthouse Brewing, but then as the plans for the brewery got scaled back, plans adjusted, and several folks including local chef Jason Merrill, Dave Brodrick (known for the well-respected Blind Tiger in New York), and Kurt Lessard decided that the South Royalton region was ripe for a gourmet burger bar. So after several months of extensive renovations while locals kept peering in and spreading rumors about the impending opening (some accurate, some not), Worthy Burger finally opening in August.